This week, in honor of National Volunteer Appreciation week, we'll be honoring our volunteers with special activities and features including "Volunteer Spotlights" written by our AmeriCorps members and a Volunteer Appreciation Brunch on Friday. Interested in volunteering? Learn what other volunteers are doing and how to get involved at ptmsc.org/volunteer! 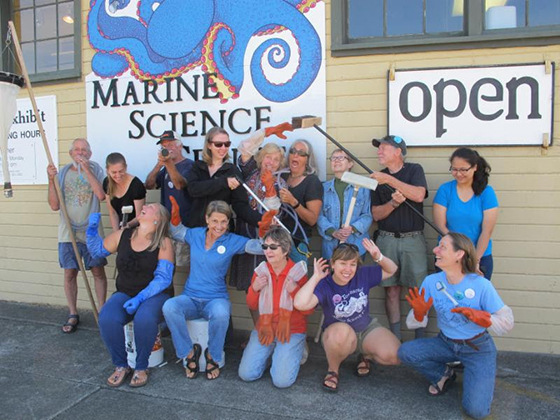 Volunteers are the "vertebrae" of the Port Townsend Marine Science Center (PTMSC). PTMSC couldn't exist without the tremendous support, passion, and commitment our volunteers bring to our mission. So we are celebrating the 42nd Annual National Volunteer Week this week, which means we're appreciating YOU! This national event first began in 1974 by the Points of Light organization, with the purpose of "inspiring, recognizing and encouraging people to seek out imaginative ways to engage their communities." Here at PTMSC, we sure do get imaginative! I'm always amazed by the range of activities and opportunities in which one can partake. There's always a random project in need of a volunteer, such as a shed to be painted, or eelgrass to be collected for our tanks, making sea creatures out of beach plastic, or helping the AmeriCorps teach groups of children in our classes. And of course, there are the constant volunteer jobs — docenting our exhibits, tank-cleaning with our "Homecrew", and participating in our many citizen-science projects, helping to put on our annual Tides of March fundraising auction, and serving on our board of directors. According to Points of Light, National Volunteer Week is about "taking action and encouraging individuals and their respective communities to be at the center of social change — discovering and actively demonstrating their collective power to make a difference." When you volunteer your time at PTMSC, you are joining a wonderful group of like-minded people, coming together as family and friends. Collectively, you take action by volunteering your time, sharing your knowledge with the community, and contributing to real, meaningful change. The humor and grace you exhibit in times of stress, and the joy you have in giving back to this community are always huge sources of inspiration for me, so thank you! My favorite days at the Science Center are those when I get to surround myself with all you wonderful people!